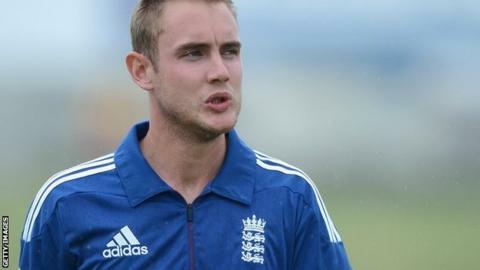 Stuart Broad says he could be forced to play through the pain of a heel injury for the rest of his career. The England Twenty20 captain, 26, is suffering from a lacerated fat-pad at the bottom of his left foot which forced him to quit the tour of India. But medics have been unable to find a cure and he will play with a specially-fitted boot to minimise the damage. "There's no operation or injection suitable, but it's manageable at the minute," he said. Broad has taken three wickets in England's warm-up matches for the first Twenty20 international with New Zealand in Auckland including a hat-trick against a New Zealand XI in Whangarei. The Nottinghamshire all-rounder has been a virtual ever-present in the England team in all formats since breaking through on their last tour of New Zealand in 2008. And he insists he can manage the injury and continue his career. "It's not a major problem. I don't get too down about it," said Broad. "They're speaking to specialists all over the world trying to find what they can do. "It's going to be a long-term thing. It's not going to go away overnight, it's something I just need to manage. "It's been pretty good for the last two weeks of bowling and touch wood it can stay that way for a bit. "I've found good ways to look after it. But it's one of those things that's not going to go away with a week's rest, or a year's rest. "It's just something to look after and be careful with."